The Sheriff’s Office offers many services to the public including: fingerprinting, public records, civil service, concealed handgun permits and burn permits. 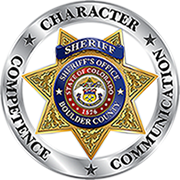 Boulder County Summons (Traffic Tickets) This online system will allow you to pay your Boulder County Sheriff’s Office summons/ticket. Civil Section This includes summons and complaints, subpoenas, court orders, writs of execution, writs of garnishment, and writs of restitutions. Communications Section The Communications Section is a primary Public Safety Answering Point (PSAP) for Boulder County. Concealed Handgun Permit Information Learn more about applying for, or renewing, a Concealed Handgun Permit. Emergency Mass Notification System This system allows residents of Boulder County to be notified of emergency situations. Notifications can be received in a variety of ways, including cell, home and work phones, and by text messaging or email. Records Section Reports held by the Sheriff’s Office may be obtained from the Records Section. Restorative Justice Restorative Justice provides a process by which victims are heard and understood, offenders take responsibility for harm, and where loved ones and community members offer support. Ride-Along Program We offer a ride-along program for citizens wishing to observe firsthand the duties of a Deputy or Animal Control Specialist. Shoulder Patches The distribution of Sheriff’s Office shoulder patches to collectors is coordinated by the Sheriff’s Cadets as a fundraiser.